I often get asked questions about how I train. These questions often debate the issue of volume and low volume high intensity style. The truth of the matter is, I train both ways, but it really depends on where I'm at and what I'm trying to accomplish. It's very easy to get burnt out on certain programs, and more often than not, the type of training routines I send people are merely “templates” that are designed to be a groundwork foundation. There is certainly nothing wrong with making mods and adaptions based on your own body and your own instinct. I am partial to HIT style training. HIT style is similar to that of Dorian Yates and the late Mike Mentzer. Basically the logic behind it all is to stimulate a muscle, introduce it to a new stress, and then lay off it until the next workout. High intensity training is what the name implies; intense!! It's a style of training where sets are so brutal and extreme that you couldn't possibly duplicate the same effort for multiple work sets. This style of training is based just as much around recovery as it is based on intensity. It allows you to stimulate a muscle, stimulate it more often, and recover faster. Let's think about this logically for a moment. Do you think it takes more recovery as a beginner squatting with 135 lbs on a bar, or as an advanced trainee who is using 500 lbs? If you guessed the latter, then you stand correct!! Much of my training is based on HIT principles, with a little instinct thrown in the mix as well. What I like to do is a proper warm up, then absolutely annihilate a muscle in an all out war style work-set. 1. Incline Nautilus machine press- 1 plate per side for 12 reps, 2 plates per side for 8 reps, 3 plates per side(work set) for 15 reps w/ a true 4-5 second negative and 4-5 second positive. 2. 2 sets of pec deck with 160 lbs for sets of 15 reps with a very slow and controlled squeeze on every rep (160 lbs on pec deck is super light for me, this was all about squeeze, basically “posing” with every rep) Chest was FINISHED after this!! 3. Lateral pulldowns- 120 lbs for 15 reps, 140 lbs for 8 reps, 180 lbs for 8 reps, one work set of 220 lbs for 15 reps, then immediately dropped back to 120 lbs and did another 8-12 reps very slow and controlled and squeezed each one like doing a rear double bicep pose. 4. T-bar rows- 1 plate for 12 reps, 2 plates for 10 reps, 3 plates for 8 reps, one work set of 6 plates for a set of 12 reps, slow and controlled. BACK WAS DONE!! 5. Side lateral raises- 1 set of 12 reps w/ 15 lb dumbbells, 2nd set was 10-12 reps w/ 25 lb dumbbells, then one work set w/ 40 lb dumbbells for 15 reps, rest 15 seconds, another 5-6 reps, rest 15 seconds, then 3 or 4 more reps. SHOULDERS WERE DONE!! 6. alternate Db curls- 1 st set was 15 lb dumbbells for 15 reps/arm, 2nd set was 25 lb dumbbells for 12 reps per arm, one work set of 40 lb dumbbells for 20 reps/arm, rest 15 seconds and then 4-5 more, rest 15 seconds and then 3-4 more. BICEPS WERE DONE!!! 7. tricep pressdowns- 1 warm up w/ 50 lbs for 15 reps, second warmup w/ 70 lbs for 15 reps, one work set of 130 lbs for 20 reps, TRICEPS WERE DONE!! 8. decline situps- 5 sets of 25 reps, ABS DONE!! That was my workout for today, in and out of the gym in about 45 minutes tops. I will take tomorrow off and then the next day I will do my upper body split again and probably change exercises. I will train in this same fashion, and then probably do it again later in the week. On my off days I will perform cardio for 30-40 minutes/session on stairclimber. Doesn't look like much huh? But the intensity of these work sets is so high that it just doesn't take me more than this to accomplish what it is I'm trying to do right now. I'm dieting and to train with extreme volume at this point is not beneficial to me. I prefer to hold a good and full look and I find that sometimes when I train this way I get a pump that stays with me. It doesn't go away halfway through a workout like it does with volume days. AT WHAT POINT TO I SWITCH TO VOLUME? I switch to volume when I need a break from the intensity of sets like I've done in HIT training phases. So I will take a good 4-6 weeks or so and use lighter weights for more sets. The purpose of this is to keep muscles stimulated but allow myself recovery time before the next HIT phase. I may also switch to light weight/volume as my bodyfat gets much lower because at this point I'm trying to avoid injury. 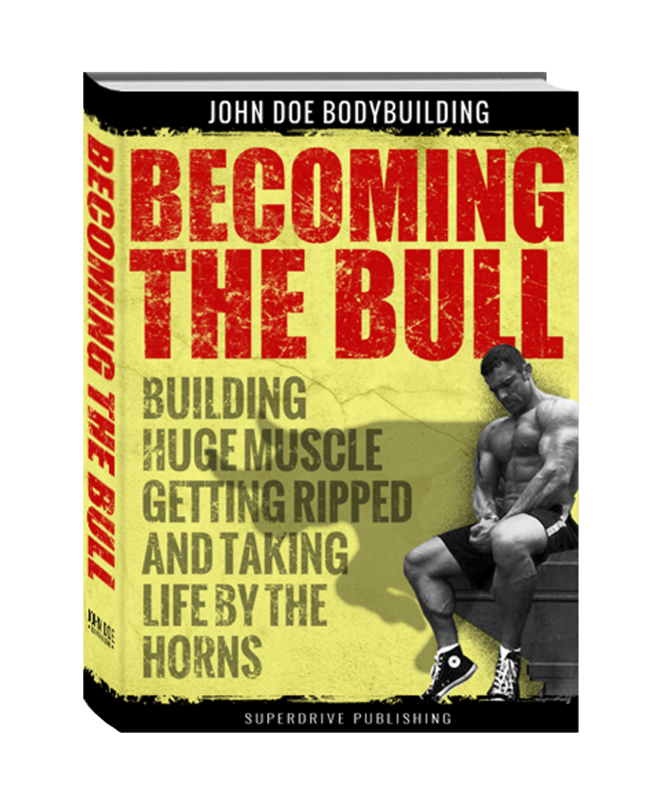 This was Dorian Yates's biggest mistake, he didn't know when to back off. He admitted this in many of his past interviews. He said that he wished he would have changed up his routine and backed off the intensity and heavy weights as his competitions drew nearer because he would have avoided a few serious injuries he had. After I leave the gym it's time to eat. I will usually either eat out at Chipotle Grill or go home to eat. If it's a nice day then I'll go to Chipotle grill to eat, because I like to sit outside to eat and I like the social aspect of it all. This gives me a chance to meet new people or meet a buddy for lunch. Today it was Chipotle grill (specifically a steak and rice bowl). If that's the worst thing I'm doing then what the hell right? I knew a guy who ate at this place right up until his bodybuilding competition and he came in shredded like you wouldn't believe!! So that's it, that was my workout today and post workout meal.